As Rangers fans know, getting Our Rangers back is utmost priority. Building our club back to the behemoth it should be. We don’t expect to win the Champions League any time soon; just forming a credible challenge to Celtic is the medium term aim. Maybe Steven Gerrard will deliver that, who knows, but last night’s International Champions Cup clash between Manchester United and his old team Liverpool gave another insight into long-term strategy that Rangers should be aiming towards. Michigan’s Big House was the venue for this match, in a tournament with increasing relevance. 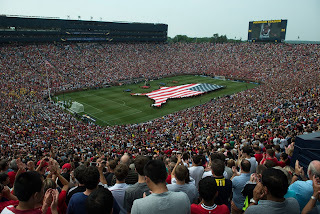 Only the biggest and best names get invited and over the years they’ve started sending their best players; because they know the American market is a huge one, as evidenced by the quite impalpable 101,254 crowd who showed up for a match between two English teams (still not as big as Utd Madrid in the same ground which was 110k). Not only that, but there were hardly any ex-pats in the audience, with, instead, a mostly home-based crowd filling out the rafters for what must be one of the biggest overseas matches of two British football teams in recent memory. Ibrox Noise, some years ago, discussed Rangers’ failure to exploit global markets – this was just after our troubles of 2012, and last night’s crowd in USA rather epitomises the success British clubs can have with good overseas marketing. Often the argument is ‘they’re on TV over there, that’s why they’re so big’ – yes, and they’re on TV because the USA wants giant brands like Manchester United and Liverpool – and giant brands like these two want the USA market. Those brands have grown themselves through sheer graft and that’s why they are now big business in the USA and the Far East. Name is only one part of a club’s global appear, they have to actually put ‘boots on the ground’ and do the work it takes. The SPFL, in a rare defence of them, did actually try to get Scottish football on the global map recently with a TV deal in China – a good move, for a market of 1.3B people. As yet we are not yet really seeing the benefits of this deal, nor its broadcast range in that country, but Rangers (and our green and white friends) have a long way to go before an overseas Old Firm match gets even half of Utd’s crowd. Even 25k would be a big success. Even Celtic, who proclaim to be ‘the most popular club on earth’, couldn’t even fill a 15k stadium out to a third when they visited Armenia recently, while we saw how empty the Phillips II stadium was in Macedonia v Shkupi. We fared slightly better for the Croatian clash, where 7,000 showed up to a 19k arena, but still Rangers and Celtic are a long way from fulfilling their marketing potential. But this is about Rangers. We must say the Steven Gerrard effect has been significant, given his brand globally is probably bigger than Rangers and Celtic’s combined. Gerrard is the most famous football icon since Gazza to make his way to Scotland and Rangers (and Scottish football) will only benefit from that. But more needs done for Rangers to realise our potential – it’s a wasted opportunity to see a huge brand like Rangers failing to have any global standing like they should – markets are there to be exploited, and thousands if not millions of new fans are waiting to hand over their cash and grow our club. But we need to do the groundwork and that part needs some TLC. It harks back to the past and when English sides toured USA and Asia and now have a massive global brand. We didn't do this properly, and now we're suffering. We've never put real effort into overseas branding work. Hi IN, do you mind posting a link to the article where you disscussed Rangers failure to exploit the American and global markets a few years ago as I’d be very interested to see what you had to say back then. Also i would like to see the statistical evidence you have come by to suggest there was a small Expat crowd at the game. Updated. As for ex-pat - journalists at the match reported 'few British accents'. Good point. It would also help if we could finally get the ok to sell our football tops, independent of any trader. Whilst in the past you would see scores of people, not just Scots, wearing our tops overseas. You never see that now. But Liverpool, United, Chelsea etc tops are everywhere. can't imagine seein football fans globaly trying to get their hands on a windass top, except turkey! no pun intended. (joking) we would need to consider an iconic design for the famous gersey (home) which is instantly recognised worldwide. something like the slim jim top with 1872 across the chest, white shorts, black socks /red tops. all tops could have 1872. I would welcome a chance to see Rangers over here. Even if you had to start by "barnstorming" from one end of the country to the other playing some friendlies against MLS teams. The MLS was once a huge joke over here, but the quality is getting better and better. Granted, we don't have a team in our pro league that could carry Real Madrid's starting 11's shoes, but then again, not many clubs anywhere else could either. There is also potential here in the form of taking on some outstanding Mexican teams. Chivas is a huge name in the southern US and in Mexico, and they're always playing matches here in the US. Come on over! It's too expensive for me to come to Glasgow all the time haha. you cannot exploit the global market when you have small minded and predjuiced indviduals who run small minded clubs who are more concerned with trying to put their biggest commodity out of buisness for the benefit of others, whilst at the same time ignoring warnings and idly standing by and watching an instiution being dismantled. cheers bill, only in glasgow would one club stand in the way of another raising the profile of our small countries triumph on the european stage in the disguise of fair play. re:2008? A club like no other right enough! for all the wrong reasons.. We welcome the chase from the SAN GIRO!